Fresh beef offal glazed in an exquisite miso sauce is a local specialty of the Tsuyama area that is well known throughout Japan. Mixed with udon noodles and cooked up on a griddle, the offal gives off a savory aroma that is sure to stir your appetite. Covered with a thick, sweet-and-salty sauce and stir-fried together with fresh local cabbage and chicken that bursts with umami flavor with each bite, these delicious yakisoba noodles have become a new classic menu item. Pairing delicious rice from one of the Top 100 Rice Terraces in Japan and fresh eggs from one of the largest poultry farms in western Japan, this simple combination transforms these humble ingredients into exquisite gourmet cuisine, making this dish a hugely popular menu item that has also been extensively introduced in newspapers, magazines and on TV. Combining “Hime no Mochi,” Shinjo Village’s No. 1 specialty—known for its smooth texture and stretchiness—with a sweet broth and plenty of standard gyudon (beef bowl) toppings, this novel take on zoni (rice cake soup) has a taste that will have you hooked after one bite! Enjoy these creative roll cakes, each elaborately crafted by local (western-style and Japanese-style) confectionery makers using black soybeans, cherries, peaches and various other local ingredients. This soft-serve ice cream is made using plenty of fresh milk from local Jersey dairy cows. With a distinctive full-bodied texture, this ice cream has a rich flavor but a mild aftertaste, making it popular among children and adults alike. This local delicacy features a patty made of “Sakushu Black (Soybeans),” a Mimasaka specialty, together with shimeji mushrooms and onions wedged between a fresh-baked bun made from local rice flour. The teriyaki sauce slathered on the patty goes very well together with the other ingredients. This burger features a fried cutlet of minced flying fish meat from Tottori Prefecture wedged between a fresh-baked bun made from local rice flour and spinach. 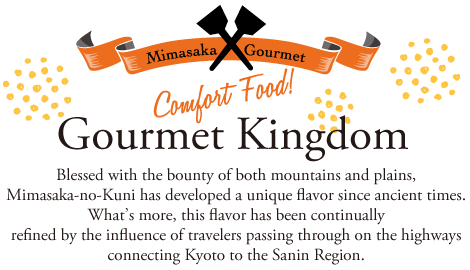 In other words, this is a flavor born out of collaboration between Tottori and Okayama. The coarsely chopped local vegetables and ample chunks of well-seasoned chicken bursting with umami flavor add impact to this country-style curry—just like mom used to make. The secret ingredient is miso, which gives the curry a rich, full body. With plentiful slices of beef pared from the bone as well as local vegetables and tofu, this soy sauce-based nabe (hot pot) is chock full of umami flavor! And yet, you will be surprised at just how subtle and refined the flavor is! Bringing together citrons and potatoes (two local specialties of Kumenan Town), these croquettes contain fresh citron peels. These particular croquettes are closer to a snack than a side dish. Available for sale alongside fresh fruits and vegetables at Sansan Kumenan and also at Uenocho Community Center on the 2nd and 4th Saturday of every month. With only twelve seats available, this soba noodle shop may be small, but it’s jam-packed with local hospitality—from the farmers who grow the soba (buckwheat) and vegetables and raise the chickens to the noodle making master, the ceramic artist and the charcoal maker. The next time you’re on National Route 53, why not take a ten-minute (by car) detour and drop by? The shop also offers hands-on soba making lessons for groups (up to 32 people) by reservation. You can also enjoy viewing the terraced rice paddies of the nearby Rice Terraces of Ohaganishi, making this location ideal for experiential tours, PTA events and so on. This bento features wild vegetables and other local specialties of Kagamino Town. Reminiscent of the bento grandma used to make, this bento will cheer you up with its made-with-love flavor. Made using only the highest quality wild deer and boar meat from animals hunted within Mimasaka City, local wild game cuisine is low-calorie and high in protein. Wild game is served at Ainomura Park, Nambatei and other restaurants in the region. Using Jersey milk from Hiruzen, these new sweets recreate the sweet taste loved by people in the Mimasaka area some 1,300 years ago while adding a more modern arrangement. You can enjoy the wide variety flavors and textures of both western and Japanese sweets. “Yamakko Workshop” is was founded with the aim of reviving the handmade tofu and fried tofu for which the Ohaga had been known until production stopped twenty years ago . For just 600 yen, you can enjoy a set meal that features fried tofu, fresh rice from the rice terraces and dumpling soup made with okara (bean curd pulp left over from the tofu making process). They also sell side dishes made with fresh vegetables as well as okara furikake (seasoning sprinkled on rice), which is one of Misaki Town’s “Sixth Industry” agricultural development products.